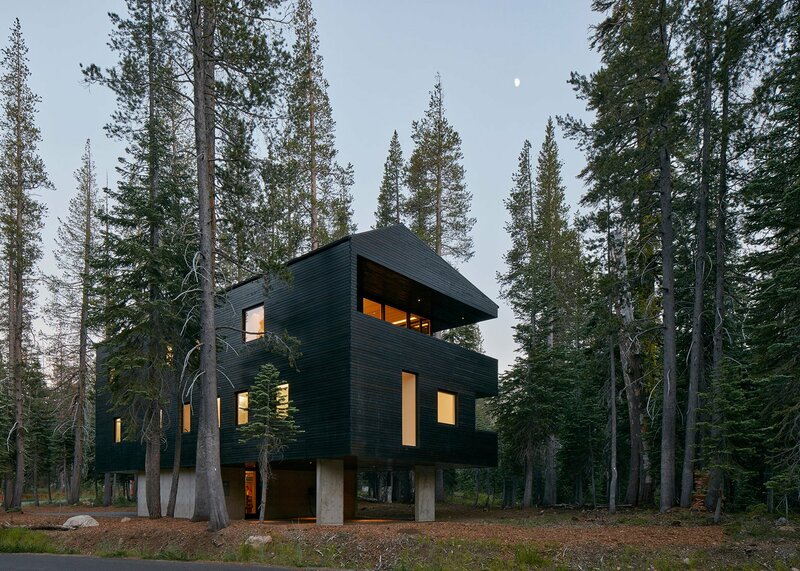 This northern California cabin by Mork-Ulnes Architects is clad in tar-coated timber and sits atop a concrete plinth – measures that both help protect the structure from heavy snowfall. 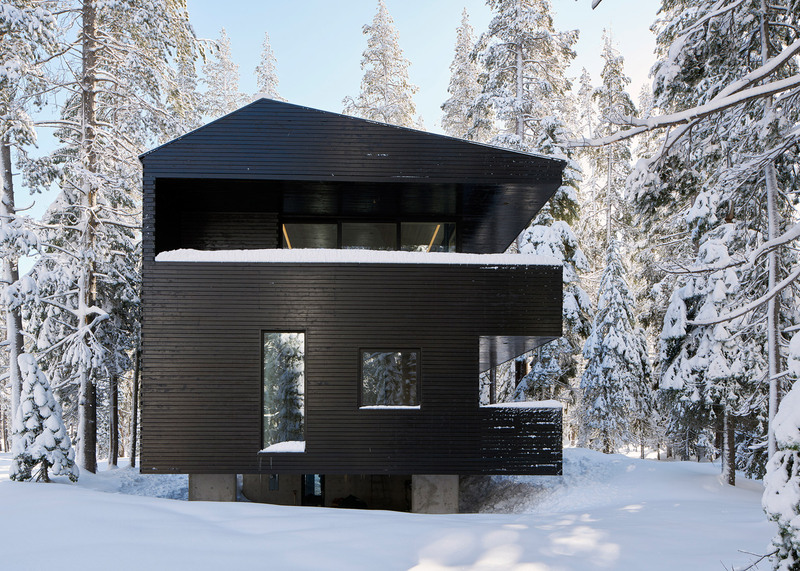 Encompassing 3,300 square feet (306 square meters), the five-bedroom cabin is located on Donner Summit near a major ski resort. It sits on a gentle slope, on a site with an elevation of 6,800 feet (2,070 metres). The cabin's name, Troll Hus, refers to Norse mythology and Scandinavian folklore, in which trolls are said to dwell in remote mountains. 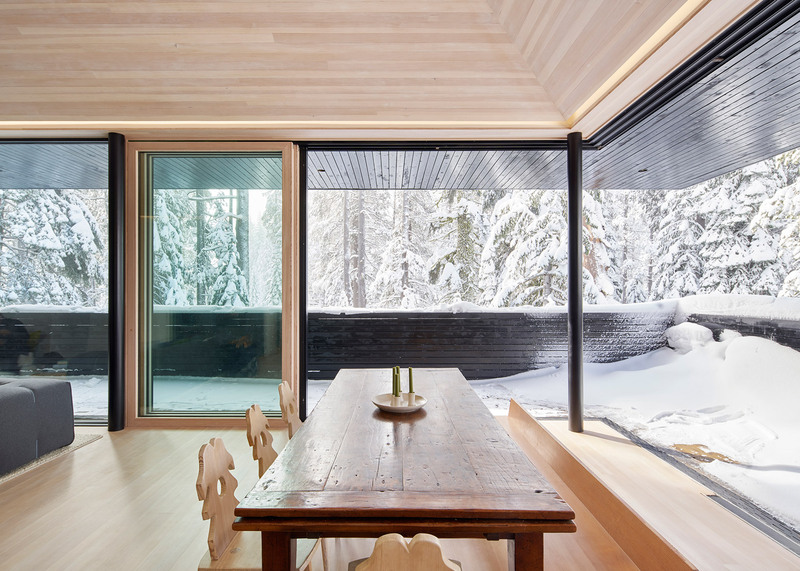 The project was commissioned by a retired couple as a vacation home for their three children and grandchildren – all of whom are impassioned skiers. "Tucked away in the mountains and nestled into a high alpine forest, the design responds to the owners' desire for a Modernist, rather secluded refuge with a constant visual reference to nature," said Mork-Ulnes Architects, which has offices in San Francisco and Oslo. 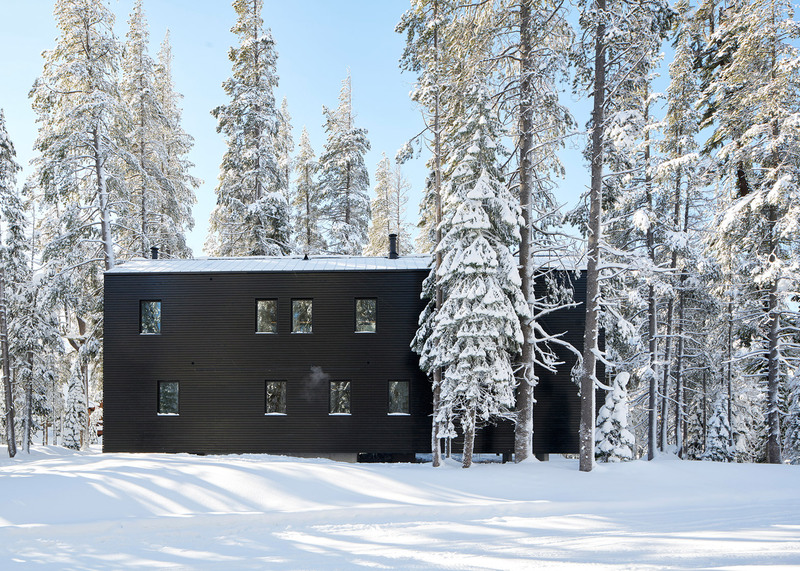 The home is clad in planks of solid timber coated in black tar, a traditional Norwegian technique that was used on stave churches in northern Europe during the Medieval period. The tar coating helps protect the home from weather and insects, and its dark colour enables the home to blend with its natural surroundings. "The distinctive black hue of the house helps it recede among the tree trunks of this wooded site," said firm founder Casper Mork-Ulnes. The design was driven by the extreme environmental conditions of the site, which can become snowbound during the winter. Its footprint was kept as compact as possible. "Based on the alpine chalet, the house is lifted by concrete legs to protect it from snow in excess of 800 inches (20 metres) a year, while still embracing a California sensibility of indoor-outdoor living," the firm said. The home's sloped roof is designed to shed snow easily, while its deep overhangs protect outdoor terraces. "The large roof overhangs prevent overheating in summer while admitting as much winter sunlight as possible," the firm said. The area underneath the raised structure is used to store ski equipment. Entrances to the house, which are on the first floor, can be accessed through an enclosed staircase that leads directly into the home or through an external stair that connects to a terrace. Inside the dwelling, an open staircase connects all three levels and is topped with a skylight. 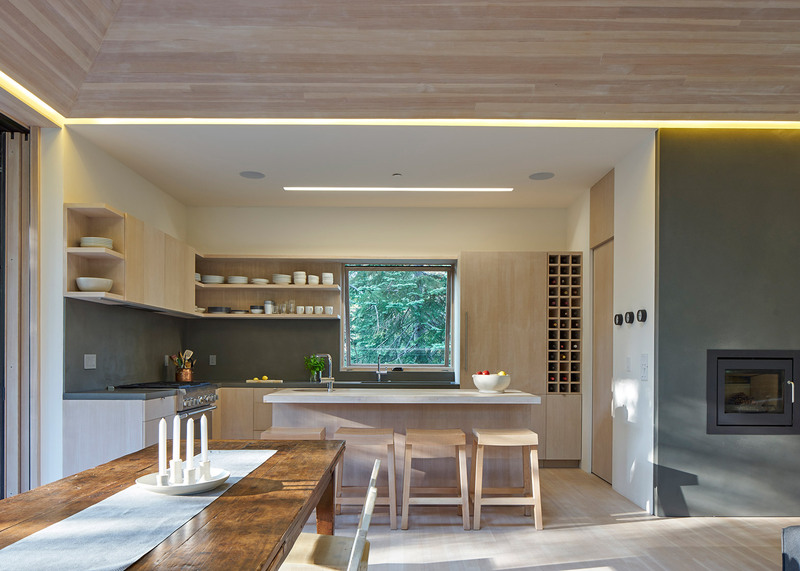 A wooden ceiling was treated with lye to maintain the light colour of the timber. 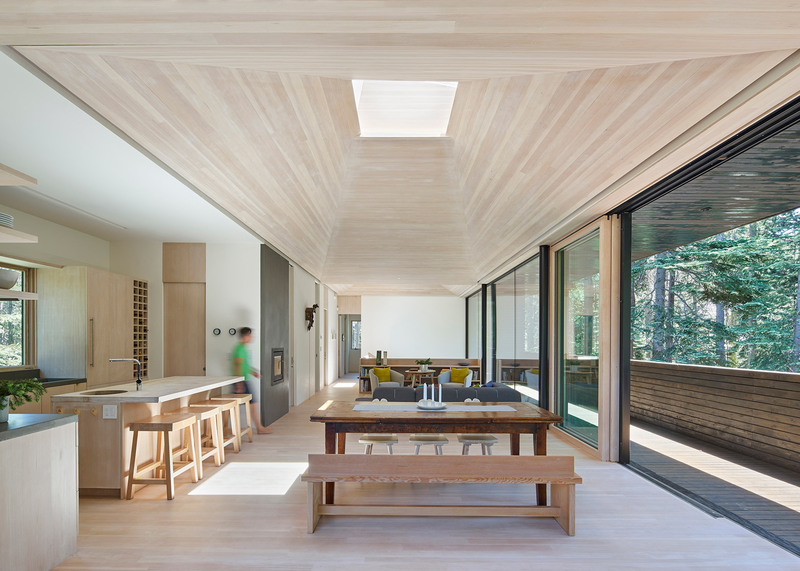 A second skylight was placed in the dining area, "creating a focal point and highlighting the sculptural angles of the lyed Douglas fir ceiling". 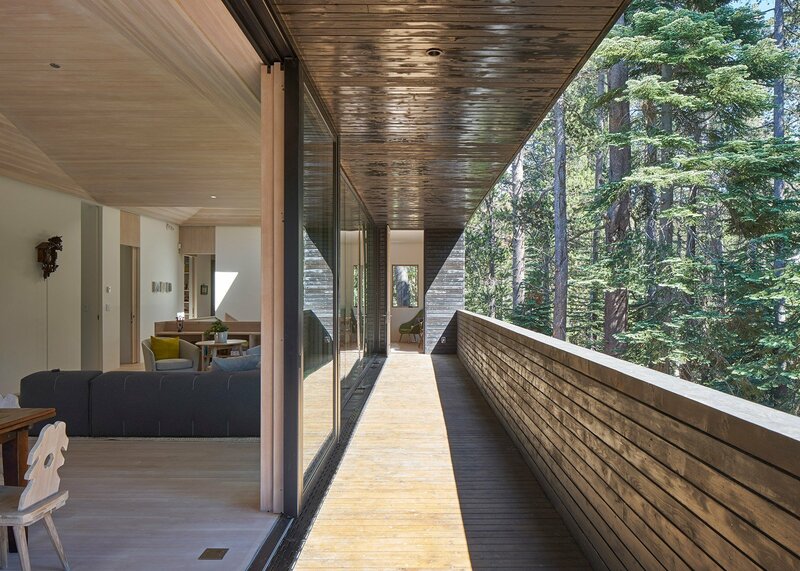 A master bedroom and a communal living area occupy the home's top level and overlook a thick canopy of pine trees. Living spaces are oriented toward the south to capitalise on solar exposure. "The large space of the living room and of the dining room, with its open-plan kitchen, is wholly glazed toward the west and south, opening up the interior to the outdoors," the architect said. The remaining bedrooms were placed on the second floor, including a bedroom with bunkbeds for the grandchildren. The interior design features modern Scandinavian-style furniture and antique pieces from the homeowners' collection. The architect's wife, Lexie Mork-Ulnes, oversaw the interior design and created a number of custom pieces, including a dining table bench and bar stools. "The owners were looking for a relaxed, welcoming environment," said Lexie Mork-Ulnes. "We suggested an interior atmosphere that is simultaneously cosy and airy. We went for a stripped down, almost purified aesthetic." 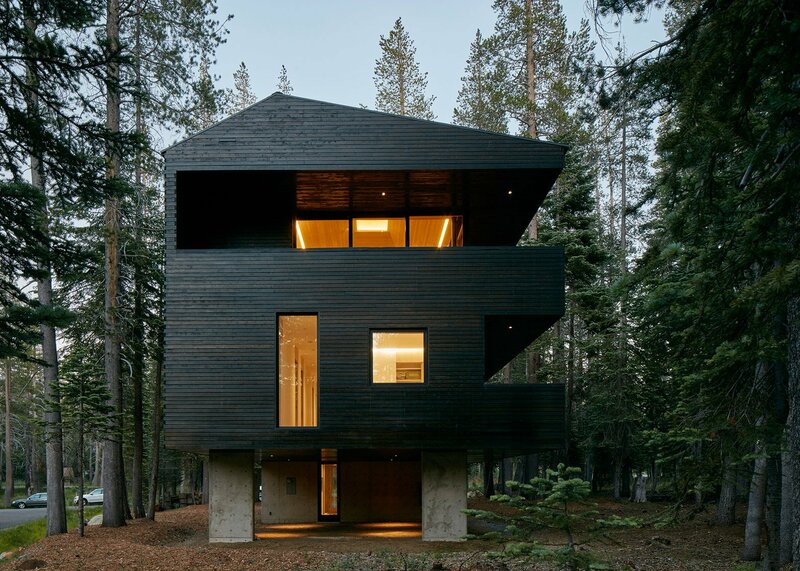 Troll Hus recently received a design award from the San Francisco chapter of the American Institute of Architects. Similar winter retreat designs include an A-framed cabin in Canada by Scott and Scott and a mountain dwelling in Colorado by Will Bruder that is clad in charred cypress.